Hewlett-Packard has been known for a long time on the Russian market, including the notebook market. But it's famous mostly by its corporate models, which have been supplied to the Russian market for a long time already. At the same time, HP has the Pavilion series for home users, which was not available in the Russian market up to recently (before Summer 2006). This series has always had a number of interesting peculiarities. In particular, as notebooks were intended for home users, their design cardinally differed from that of corporate models. It was better - notebooks of this series always looked attractive. Pavilion notebooks were also notable for powerful configurations and democratic prices (we are speaking about the American market here). So these devices were popular among grey dealers, who brought them here from the USA at their own risk. By the way, these models were said to have a relatively high percentage of defective samples, which had to be repaired at the cost of dealers (or they had to return them to the USA). Hewlett-Packart Pavilion DV5287ea. Pay attention to reflections in the panel. The mirror effect is rather strong. This all-purpose HP notebook will not let you get bored in your journey, it's just as powerful as a desktop PC. A fast, reliable computer can help you do your homework, to make colorful presentations, or to watch DVD in any place. 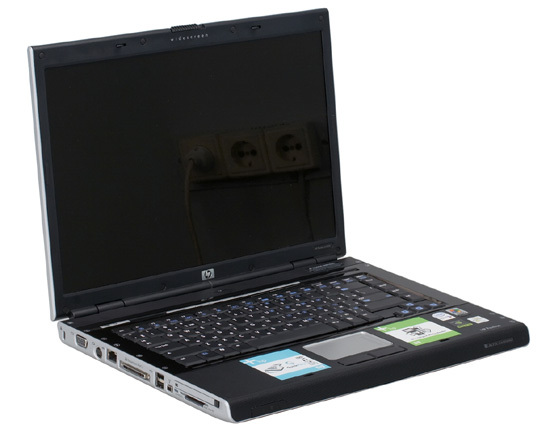 We tested Hewlett Packard Pavilion DV5287ea. HP's web site is actually well organized, you will have no problems finding necessary information. I easily found pages with product specs and support. My attempt to find drivers gave this page. There were not many drivers at the time of my visit (2 links). They are probably updates. I failed to find the general bundle "high-handedly". I can only note that selection of authorized service centers by towns does not work, you have to browse the general page. The web site may also contain other minor bugs. We used the standard Windows profile for our tests - "Portable/Desktop". Display brightness was set to maximum. According to test results, capacity of the battery is 97680 mWh. On one hand, it's a large heavy desktop notebook, it usually needs a battery in case of power failures or for brief working sessions outdoors. On the other hand, the battery is powerful... So abstractedly, the results are not bad, but the battery life for DVD playback is just two hours - just enough for one modern movie . However, it's not a problem for a desktop notebook. DV5000 is a wide-screen model, so it offers enough room for a keyboard. Nevertheless, no one would have designed a keyboard specially for his very model. That's exactly the case – this model is equipped with a standard keyboard with an insert around it looking like black glass (easily stained with finger prints). The keyboard has a practically standard layout for notebook models. All keys are placed exactly where they are expected (if you are familiar with the vertical row of home/pgup/pgdn/end buttons on the right), even ctrl is in the corner and enlarged. It's very convenient, especially when you start using it after a desktop keyboard. There are no extra keys near the cursor controls. So, I have no gripes with the layout, all keys are grouped in the standard convenient way. What concerns typing, the keys seemed hard to press, a traditional situation with HP and Compaq. What concerns me, my fingers start to ache after a long period of typing. It also seemed to me that the keyboard had minimal backlash in the center, it's so insignificant that there are no negative side effects. I don't know the general situation with this series. The touchpad is very wide (good for a wide-screen model), there is a jagged scroll bar on the right. The touchpad has two buttons, very soft, the click is not loud. On the whole, the buttons and the touchpad itself produce a nice impression. DV5000 offers lots of interesting and useful features to its users here. Let's start with additional buttons. 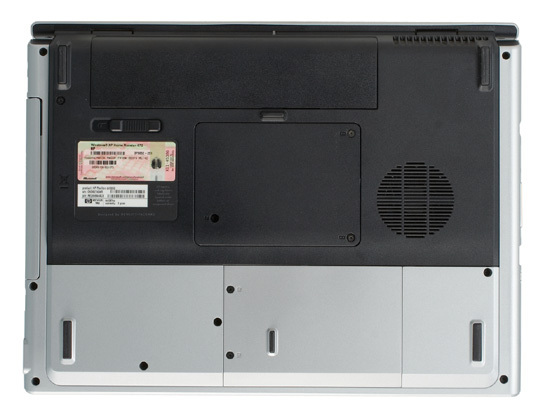 DV5000 has five of them, they are located in a horizontal row near the power button. 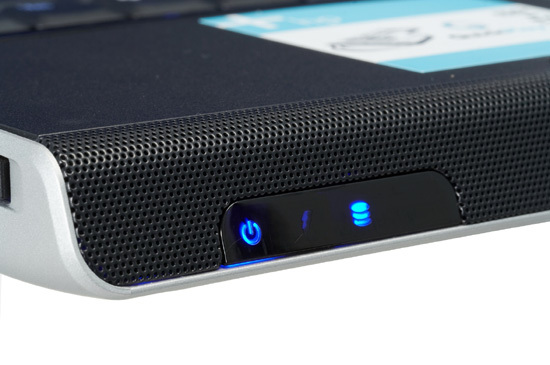 All additional buttons (including the power button) contain built-in indicators, bright blue. They are as bright as the display at night, which is not always good – sometimes they hurt the eyes. The additional buttons – DVD (it boots up the notebook in a special mode - a player for DVD and music files, and a photo viewer, OS is not loaded), the return button (in DVD mode, it pops up the main menu) and three volume controls. The mute button lights up only when the sound is muted. When the sound is on, the LED is not alight. It's an interesting solution. But most of the time you have an impression that it's burned-out (they should have done vice versa - the button is alight, when the sound is enabled; it would have been more logical). There is a separate button to enable the wireless interface. The button is above the others in the center of the case. When enabled, a ring under the HP logo starts shining blue. It seems to be disabled on the hardware level, that is you can enable/disable it in BIOS, not only from Windows. All work indicators in this model are on the front panel. Not quite optimal, because you don't see them well, when you sit at a desk with a notebook in front of you. Besides, your left wrist will block them as you type. You don't see them well either, when you stand near a desk with a notebook on it. On the other hand, this solution is acceptable for a desktop notebook, because it's open on a desk most of the time. Caps and Num lock indicators have a curious design – they are in the form of stripes at the side of the keyboard near the corresponding buttons. They light blue, when enabled. Interestingly, numlock is enabled in combination with Fn. If you press this button alone, scroll lock will be enabled, but the indicator will remain dead. In my opinion, it should have been done vice versa. The notebook, both open and closed, produces a very nice impression. The front and rear panels are slightly slanted, which makes the model look very original. Silver finish (good metallic hue) and black insides are a nice combination. So we can safely assume that the notebook will look well at home – expensive and stylish. Let's examine the layout of ports. The front panel houses only indicators and audio grilles, plus the Altec Lansing logo. The left flank houses the following elements (from left to right): Kensington lock, a connector for an external monitor, 7-pin S-video, RJ-45 LAN, a dock connector, 2 x USB 2.0, IEEE1394, a PCMCIA port, and a multi-format card reader. The right flank houses an Expresscard slot with audio jacks under it, another USB 2.0 port, a multi format optical drive, a modem connector for a phone cable, a power connector. The rear panel is completely occupied by a battery and a fan grille. There is a large air intake grille of the fan on the bottom. The notebook was standing on a soft surface for a long time during our tests, it did not grow very hot (if it's not loaded much). DV5000 is a home multimedia model. As such, it must be equipped with good components. What concerns the display, it's a usual TN-film panel with a glossy finish, it's become fashionable now. Glossy finish makes the picture subjectively brighter and more saturated. Indeed, movies look very good. The reverse side is the mirror effect, when a panel reflects illuminated objects. If you watch a movie (especially sitting opposite to a window or a light source), you can see well your reflection in dark scenes. Horizontal angles are rather good, at least they are not irritating. But the situation with vertical angles is not that peachy. You can adjust the display to watch a movie so that colors on the entire display are similar, but if you deflect the display a little or bow it forward – distortions are inevitable. Inverted colors are especially irritating. If you title the display back, colors are immediately distorted. It's not that such behavior differs from the other notebooks. But I expected this very model to offer a more interesting solution. And the audio system in this notebook is really very good. HP uses Altec Lancing speakers in these models. I haven't tried to compare them with JBL in old Compaqs. But DV5000 speakers are evidently better than in other notebooks. Firstly, the notebook sounds much louder than the others. Secondly, its audio quality is higher. The sound does not reach the level of desktop audio systems, of course (insufficient bass and slightly cut HF, I should say), but it can be already compared with them! You don't just "follow dialogs", but start to enjoy the audio track. Speech is reproduced much better. So it's a great step forward. Considering that everything is available "by default" - you don't need to plug any devices and use additional cables… so, audio quality of this model is much higher than in similar models. This aspect of the notebook is a joy. The noise level is rather low. It's natural – the notebook is big, engineers could install a large efficient cooling system. And the huge air-grating on the bottom suggests certain ideas. I'm glad that wrist pads never get hot. The keyboard gets warm, as well as the central part of the bottom. I found no negative consequences. HP DV5000 is bundled with lots of utilities. Let's start with HP wireless assistant, which shows status of wireless devices and allows you to disable only one of them (the button enables/disables all wireless interfaces at once). There is also a tray utility to control multimedia buttons. The utility contains four tabbed pages – multimedia (to manage buttons in playback mode), functional keys (to see FN+ combos), scale (to manage font sizes) and utility settings. There is also a standard Synaptics utility to configure the touchpad. Besides, HP bundles this computer with a number of other utilities (HP photosmart premier, HP Software update), for example, to copy photos or to download updates for drivers and utilities. There are also three utilities to restore your system – to create system restore CDs, to restore a PC, applications and drivers. I tried to use the PC restoration utility and found two options – to restore Microsoft OS (to launch its recovery console) and to restore a PC. So when I restored a PC (I thought it would roll back to factory defaults), the system recorded my applications to the image and restored the PC with them in place! So I had a lot of questions (and one question was answered – why the system was delivered with applications of the previous reviewer) how it works. But I didn't test it. I can note that it's certainly a radical advantage for a home user. But I'd like to have more functions to control this process or at least to know that my applications are backed up. The notebook is equipped with a stand-alone player to watch DVD and listen to music without booting into the primary operating system. Considering the multimedia nature of the notebook and its speakers, this player is justified in this case. Windows still starts up as you press the DVD button (it starts to load), but it's not loaded completely and then you are shown the main menu of the player. I decided to watch a DVD movie as a test. I had an impression that the player slightly stretched video vertically to remove black stripes at the sides. The player is quite simple, controls are rather convenient, there are not many settings. I liked how easy it's to display and hide the playback menu. The player stops working, when the battery level drops below 10%. That's definitely unfortunate, because some playback resources still remain. And Murphy's law blocks playback either in the beginning or in the middle of a final scene. It's hard to put into words your feelings, when playback stops in the middle of the turning-point and the player refuses to continue playback, but the notebook is still working and displays mocking 10% battery. Battery time for DVD playback is two hours sharp. In other respects, it's a very convenient and useful addition. It should be noted that you can also listen to music and browse photos in this mode. These are handy features, especially as their interfaces are so simple that you can teach your family use them, even if Windows is too much for them. So it's a nice add-on to the main functionality of the notebook. The bundle also includes a remote control. 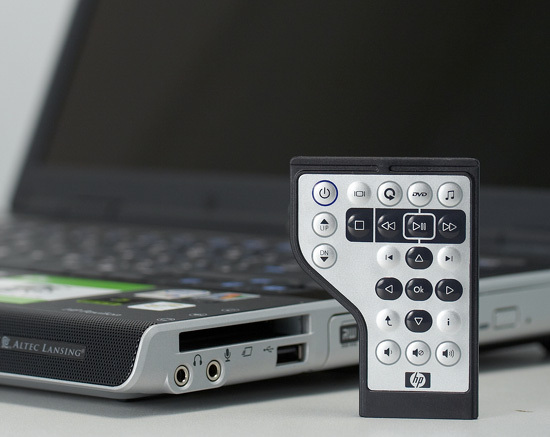 This remote control is tiny and can be inserted into the Express-card slot instead of the gag. It's very convenient and you can always have it at hand. The remote control contains quite a lot of buttons to control the player as well as to navigate your notebook. I cannot say I used the remote very often, because the notebook was usually close to me when I watched movies - it was more convenient to use the keyboard. But the remote is very useful, if you sit rather far from your notebook. The remote is not very ergonomic. But it's pardonable for such a device, which can be always carried with the notebook at that. So, the remote comes in handy when you watch movies or listen to music, especially as it can also turn the notebook off. By the way, I'd like to note one important peculiarity (especially to those who don't read manuals, like me) – the remote control is installed into the Xpresscard slot (on the right), not into PCMCIA (on the left)! This is convenient for right-handers. But I'm a left-hander, so I automatically inserted the remote into the wrong slot. There were no fool-proof mechanisms there, of course. And the PCMCIA slot is longer, so the remote control falls deeper than necessary. So, I quickly removed it. But I won't be surprised if service centers will charge for this operation - it will be a frequent situation. On one hand, it's a good desktop notebook with a decent battery life and a powerful configuration. On the other hand, I'd like to see a more powerful video card and a *VA or IPS panel, which provide much better image quality. (But I'm not sure whether the market would have appreciated this feature - people that have an idea about different panel technologies are in minority, most people just compare price tags. But it's still a pity). Especially at the price of this notebook. I also have a number of minor gripes. Some of them are included into this article. But they are all insignificant. If I cavil about minor points, it means that I generally like the model. Speaking of minor gripes, the built-in DVD player is indeed easy to use, but it shouldn't have stretched video (besides, it might have offered more settings). One "dead" LED in the row irritated me throughout the entire test procedure. The LEDs are too bright (but some people are attracted by bright blue lamps). Silently adding installed applications into a restore image may certainly save some trouble for inexperienced users. But I'd like more control over this process. And so forth. The main advantage of this model is luxurious Altec Lansing speakers, way better than in all other competitors. There remains a question about statistics of defective samples. But as a rule, Hewlett-Packard takes its warranties very seriously. And finally, HP representatives, which lent us the notebook for tests, asked me later whether I wiped it or not - there appeared scratches on the keyboard frame. It suggests an idea that the notebook will not look great forever. The shiny glass-like frame may gradually turn into old auto lacquer with little scratches. By the way, it was one of the main gripes with new notebooks at the presentation – the lid gets dirty too fast, too many people thought that it would get scratched. Representatives of the company announced that they couldn't scratch the lid. When I asked their permission to try, they said that I could do it only after I bought it. That is users will have to perform this test at their own cost. It's an all-purpose home multimedia notebook, designed mostly for home use and rare trips. This notebook should be on a desk at home and only rarely go out with its owner. It's destined to play movies and music, show treasures of Internet in the evenings, and sometimes run some game (not very heavy). The rest of the time it should decorate your desk with its exterior and blink bright blue LEDs. That's where the notebook is good. It can easily perform a wide range of usual tasks, it looks good on your home desk, it's attractive, and it offers luxury audio! It's not a working notebook for travels - too large and heavy. You shouldn't carry it with you very often, especially as we don't know the consequences for its case. Besides, it's too bright for dull offices or presentations "on your knee". Not its element. Keep it at home, feed it with interesting discs, and wipe your finger prints with a soft cloth – in return, it will accompany you to your summer cottage and will show you a new movie without the trouble of plugging external speakers! It's an excellent multimedia notebook for home use from the famous manufacturer. It combines a lot of advantages and few drawbacks. But I think that it has enough advantages to please its owners. I was a tad confused by the price, about $2000. Not that it's too high in itself. But it seems to me that it's too high for this model for these days.